Account Info is shown in the first screen. The Account Info consists of the name, email address, company name if it is a business or enterprise account, usage and total storage capacity. Account Info also shows Gravatar images for users who have their Gravatar account linked with the same email address. The storage used with respect to the total storage is shown through a pie chart with percentage of storage consumption. The iPad app home screen also does personalization. Depending on the time of day, the app shows a different message and shows a different home screen background. 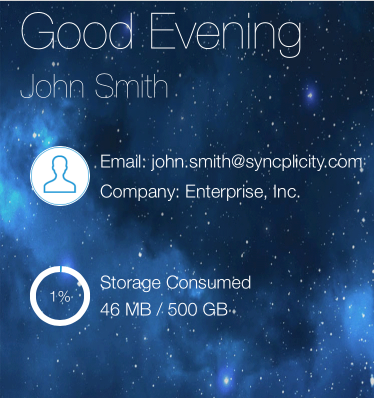 For example, the screenshot below shows the user's account information as well as a "Good Evening" message, since this screenshot was taken in the evening.